A scrapbook of photographs, newspaper clippings, and stories from the Fitzgerald family, as compiled by their daughter, Scottie.First, I’ve come to see my parents through my own pair of spectacles rather than through the eyes of others; and second, I’ve paid a tribute to them which was long overdue.I’ve long had an interest in the Fitzgeralds, and the idea of reading their personal scrapbook intrigued me, especially since another of my interests is genealogy. 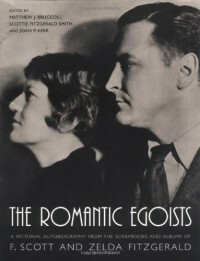 I enjoy looking at old photos, registers, and records, so this book held special appeal.This book was a perfect segue after reading Z: A Novel of Zelda Fitzgerald, to piece together the parts of the novel that were based in fact and how it all fit together to form a picture of Scott and Zelda’s life as a whole. I particularly loved the color images of Zelda’s artwork; The Nativity was by far my favorite.I did not, however, read every word of this book. It includes numerous, lengthy portions of the Fitzgeralds’ writing, as well as literary reviews, newspaper clippings, letters, and financial records that — while presenting a complete picture of the couple — it would be rather tedious to read every one. I liked the introduction by Scottie Fitzgerald, and was somewhat disappointed that more of her own insights, memories, and thoughts weren’t included in the book as well — hers would be a unique perspective.